What Wistia Triggers and Actions are supported? New Visitor - Triggers when there is a visitor that has watched a video in your Wistia account. New Video - Triggers when a new video is added to your Wistia account. New Project - Triggers when a new project is created in your Wistia account. New Visitor Email - Triggers when a visitor's email is captured. Create Project - Creates a new project in your Wistia account. Create Embed Code - Creates an Embed Code to embed a Wistia Video on any webpage. Upload Video - Uploads a video to your Wistia account. 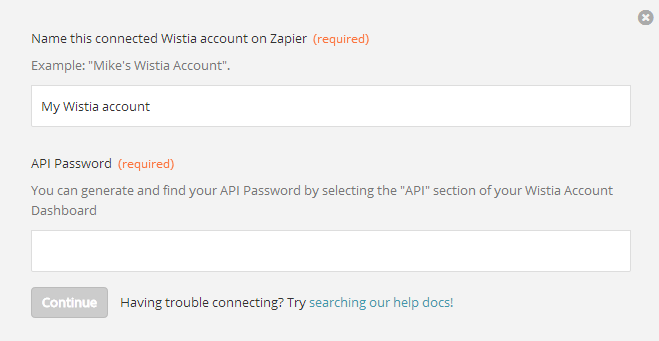 To connect your Wistia account to Zapier so it can be used in a Zap, you only need your Wistia API key. If you haven't created an API token in Wistia before, select 'Create a Token' and make sure to select 'Read, update, and delete anything' when creating that token. After that you'll have the chance to copy the newly generated API password and enter it into Zapier. Once you've entered your API password and clicked continue, we'll test your account to make sure the connection works. If it does, you're all set! Right now the "New Visitor Email" trigger can only apply to all videos in your Wistia account. With future improvements we may be able to do allow filtering so that you can segment by a particular video. For any news on new features like that, our updates blog will have the latest. Right now the Upload Video action won't be able to handle large files, the zap will stall out before adding them. Files less than 300 MB should not have problems, but beyond that size we can't guarantee there won't be issues. Uploading multiple videos at once also has the potential to lead to timeouts.